Welcome Aboard! Travel in comfort aboard our deluxe motor coach to Maine, a state wildly beautiful from its rocky coastline to its forested mountains, and whose motto is "Maine - The Way Life Should Be!" After checking into the Best Western Merry Manor Inn in South Portland, Maine for the night, we conclude our travel day with a traditional Maine lobster or prime rib dinner at the hotel. After breakfast we meet our step-on guide, and depart for a tour of Portland. The tour will highlight Portland's beautifully preserved Victorian district, and we drive past the grand dame of Portland architecture, the "Victorian Mansion," and the Wadsworth Longfellow House, where four generations of one remarkable family lived, and made significant contributions to the political, literary, and culture life of New England and the United States. We will also view Portland's busy, working waterfront and the Casco Bay Islands. A photo-stop will be included at Portland Head Light, the oldest lighthouse in Maine. The lighthouse was commissioned by George Washington and built in 1791. Next, we enjoy a fun picture stop in Scarborough, Maine at Len Libby's Candy Store to snap a photo of "Lenny" the 1,700-pound chocolate moose. 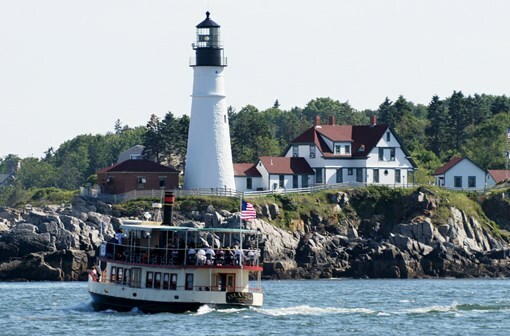 Following our tour, we take a narrated "Lighthouse Lover's Cruise on Casco Bay". We see several lighthouses, including a dramatic ocean view of Portland Head Light. After our cruise, you will have leisure time to explore Portland's renovated "Old Port" area browsing, shopping and enjoy lunch on your own. Later we depart for the Belgrade Lakes Region, traveling along some of the state's most scenic roads, and our next three nights hotel accommodations at The Rangeley Inn, "A Premier Mountain Inn" in the small town of Rangeley, Maine, situated in an area of 40 lakes and ponds. This region of Maine is a mixture of vast wilderness and soaring mountains. Tonight, enjoy a delicious dinner at the Inn, followed by a Scenes of Rangeley Photo Presentation. Photos set to music by a professional photographer, showcasing the beauty of the Rangeley Region. After a buffet breakfast, we meet our step-on guide, and depart for a tour of the Rangeley Lakes Region, an area known for incredible wildlife and beauty! Learn how 1860's Rangeley grew from a small rural farming community to a popular destination for sportsmen and sportswomen. See the area's natural beauty at several scenic photo-stops including Height of Land, a dramatic overlook and one of Maine's most scenic spots! It will literally take your breath away! Next, we visit the Outdoor Sporting Heritage Museum. When you just look at the museum's façade that's based on a 1900s taxidermy shop, you know you're in for a weird and wonderful attraction. Step inside and learn about the interesting sporting history in the area. The museum's archive includes interesting displays of local memorabilia and numerous artifacts, beautiful wildlife and nature-based paintings, carvings and more. Also, learn about the famous Americans who came to the area to fish and hunt, including President Dwight Eisenhower. The next stop of the day will be a visit at the Oquossoc Log Church. 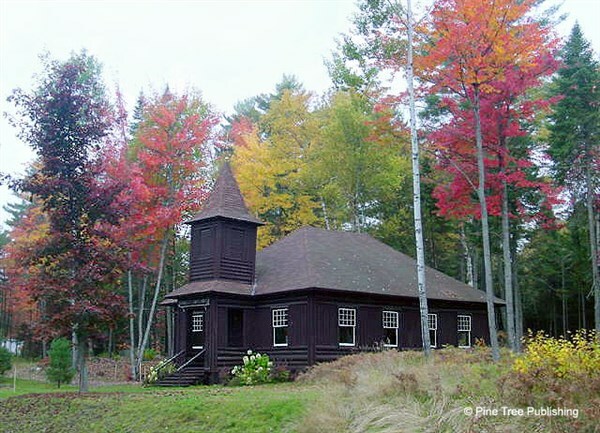 Built in 1916, the walls and major interior fixtures including the pulpit and alter are all made from spruce logs. We conclude our tour with a delicious lunch served at an authentic Maine Camp, in a dining room overlooking Lake Mooslookmeguntic. After lunch, we return to the Inn and take a narrated cruise on Rangeley Lake. You will be entertained and educated on local history as you cruise the pristine waters of the lake and enjoy endless vistas of Maine's Western Mountains. Following dinner on your own at a restaurant conveniently located within walking distance of the Inn, we enjoy an introductory Moose Program at the Inn. Then we join our step-on guide aboard our deluxe motor coach for an evening Moose Tour! We travel along the back roads in areas the moose frequent, as we search for a Maine's iconic and elusive animal! After a buffet breakfast, you are free to design the rest of your day and do as you wish! Enjoy the grandeur and charm of Rangeley's past in this beautifully restored landmark property dating back to the late 19th-century. Experience the attractions, entertainment, restaurants, local stores, and shops all conveniently located within walking distance of the Inn. Or simply enjoy a quiet day, reading a book, sitting back and relaxing on the front porch or by the waterfront on Haley Pond in the Adirondack chairs. A delicious dinner awaits you tonight in the dining room, followed by a 3-D Historical Presentation of the Rangeley Lakes Region. This special presentation allows you to view amazing stereoscopic photographs of Rangeley taken circa 1868 - 1898. You will be given 3-D glasses to view vintage images projected on a large screen as your host shares history and background. Step back in time with this very unique presentation before retiring to your room for a good night's sleep. After a buffet breakfast it's time to bid farewell to the lovely lakes region and secluded backwoods of Maine. Settle back, relax and enjoy the scenery on our drive down to the White Mountains of New Hampshire. 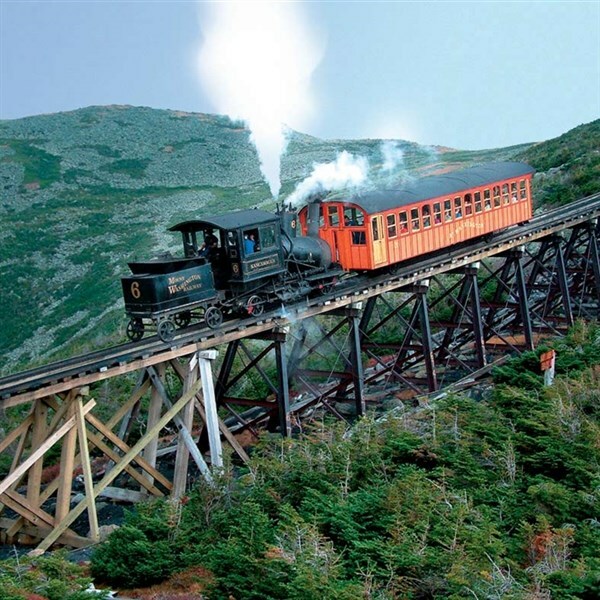 Upon our arrival in Mount Washington, New Hampshire we board the Mount Washington Cog Railway to embark on one of the world's great railway adventures. You will enjoy magnificent scenery, and marvel at the excitement of diesel locomotives in action as we climb the tallest mountain in the Northeast. A box lunch is included. Next, we travel to Sugar Hill, New Hampshire and have some leisure time to explore Sugar Hill Sampler, a remarkable example of Americana. Owner Barbara Serafini's ancestors were the first settlers of the village of Sugar Hill and built this stalwart barn over 200 years ago as a vital part of their pioneer life. Hefty beams, pine board ceilings, and original flooring are thoughtfully combined into a truly different kind of gift shop. Proudly featuring the "useful and unusual" from nearby and around the world, including gifts and handmade objects. In June the area is known for wild lupines, with fields of lupines on all sides of the Sugar Hill Sampler. A great photo opportunity! Before we board a pontoon boat for a narrated cruise on Squam Lake, our next stop will be at a local restaurant overlooking Squam Lake for a delicious dinner. This unforgettable boat cruise has something to delight everyone! 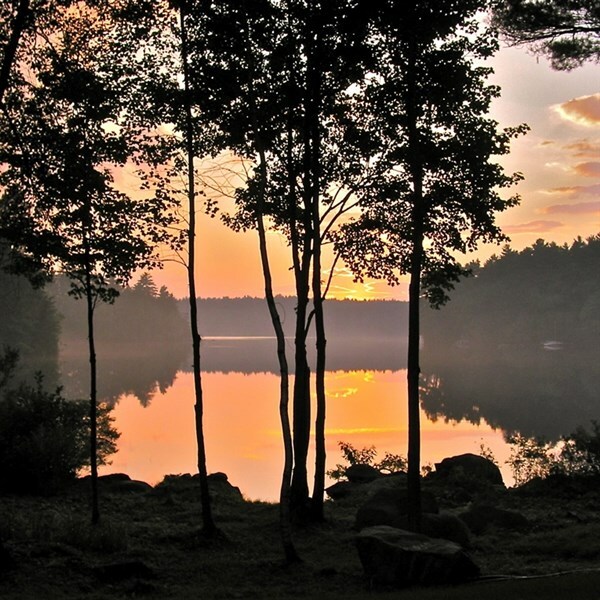 Learn about the natural history of the lake, the wildlife that makes Squam so special, the people who have enjoyed these lakes for over 5,000 years and view locations where the movie "On Golden Pond" was filmed over 30 years ago. Watch for Common Loons, Bald Eagles, and other wildlife. Following our boat cruise, we continue to our overnight accommodations at the Fairfield Inn in Plymouth, New Hampshire. After a deluxe continental breakfast, we depart for home taking with us fond memories of a wildly beautiful adventure in the Maine woods, scenic lighthouse and lake cruises and a delightful train excursion in the White Mountains of New Hampshire! An amazing and unforgettable tour!